“Flu Is Not A Season.” That’s a quote I saw recently at the Fearless Parent website. It sums up exactly what I’ve been thinking. If you’re fortyish or younger, this may sound like saying the world is flat. The over-forties out there probably remember growing up without annual flu mania. Particularly nasty flu viruses have appeared intermittently at least since the 1500s, but the ritual of terror tactics about flu every fall is recent. My own experience as a kid demonstrates: There were five kids in my house. I don’t recall any of us getting flu, or any of our friends dropping to flu either, ever. Once we had marched through the obligatory childhood infections of the day – chickenpox, measles, mumps, and maybe a stomach bug or two – we were done. It seemed that we just didn’t get sick. We were vaccinated, but at the time, that did not cover any of the infections I just mentioned. It included polio, tetanus, diphtheria.. but not flu. 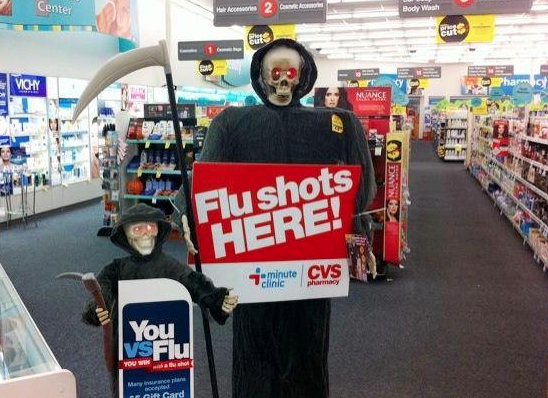 There were no flu shots. How did we all escape getting flu, or dying from it, in a world without flu shots? It’s easier than you think. Vitamin D. Still haven’t heard? Get out more often! Literally, get some sun. Vitamin D has multiple and complex roles across all tissues; it is more hormone than simple nutrient. Genetic mutations on the gene that expresses our vitamin D receptors are common. This can mean different amounts work best for different people. One of vitamin D’s many jobs is maintaining healthy barrier tissue – that is, the very spaces in lungs, gut and elsewhere in the body where pathogens initiate an invasion. It works to kill infections of all sorts, from tuberculosis to flu, without side effects. A weak vitamin D status can get you sick more often, and can cause lengthier, more complicated illnesses when you do get sick. Blood draws are unpleasant for any kid, but if your youngster is sick often, indoors a lot, has an inflammatory or autoimmune condition (asthma, diabetes, allergies), or is always slathered with sunscreen, it’s time to check vitamin D level. Keep it above 55 or 60 with sunscreen-free, non-burning sun exposure, cod liver oil (1/2 to 1 teaspoon/day), salmon, egg yolks, or supplements containing vitamin D3 (not vitamin D2). Supplement dosing will depend on your child’s vitamin D status, but typically ranges from 1000 to 5000 IU daily to maintain healthy levels in darker, colder months of the year. Healthy fats and oils: Feed rich sources from fresh (organic) foods: Eggs, meats, poultry, wild caught (not farmed) salmon, bacon, scallops; nuts, seeds, and their butters; ghee (clarified butter), coconut milk or coconut oil, fish oils and cod liver oil, avocado, chia seeds, olive oil, sesame oil or sesame tahini. Fats and oils are integral to cell walls and barrier tissue, making them as healthy, discerning, and flexible as intended. They carry essentials like vitamin A, D, E, and K into cells too. Pass on the processed food fats, fast food, or packaged foods with hydrogenated oils or trans fats. Use fish sparingly or source as cleanly as you can: Wild caught or farmed without GMO soy and corn. Cod liver oil: A half teaspoon to a teaspoon daily replenishes omega 3 fatty acids (which have anti-inflammatory and mood benefits, to name just two); vitamin A (a key immune modulator); vitamin D; and other fatty acids. Is fermented best? Many go this extra mile, but I have observed success with non-fermented cod liver oil and fish oils supplemented for children in my practice for fifteen years. This may be because I use Pharmax brand. While not fermented, it is also not chemically processed either. Like fermented oils, Pharmax fish oils rely on enzymes – not chemicals or alcohol – to concentrate beneficial fatty acids and remove odor. Use brands that self-impose stringent purity testing for toxins like PCBs or metals. Skip these brands named in a recent lawsuit for having PCBs in them. Find a healthy weight: Pediatricians have noticed for decades that overweight or obese kids are more prone to upper respiratory infections. But it is also unhealthy to be too thin, which is a common problem in my caseload. When a child’s body mass index drops below the fifth or tenth percentile, succumbing other infections is more likely. Encourage outdoor time, omit processed sugary treats except for special occasions (yogurt tubes are my favorite example), omit soda, and reduce or omit fruit juice for heavy hitters. For the featherweights, ample fats with nutritious carbohydrates are helpful: Sweet potatoes (shredded for pancakes, chopped for fries, baked, mashed, or added to smoothies); pumpkin (baked into treats, pancakes, or bulking up smoothies again); parsnip (slice into coins, coat with melted ghee and salt, and bake x 15-20 minutes); adzuki beans (plain or paste), green beans, wax beans; hummus, garbanzo beans, or dips with white or refried beans; cauliflower, Brussel sprouts, broccoli or broccolini can all work deliciously with roasting, mashing, pureeing into soups, tossed into pasta dishes or rice salads, or just plain steamed. For veggie variations, visit recipe blogs like BalancedBites.com or PaleoPlan.com. You don’t have to be Paleo-committed to enjoy these recipes! Boost immune-critical nutrients: Besides healthy fats, the right total calories for your child’s best weight, and standouts like cod liver oil, a robust immune system will use zinc, iron, vitamin A, vitamin C, and protein to do its job. This is true whether your body sees an invader via a vaccine or via natural infection. I help all my client families choose the right mineral-rich multivitamin for their children, which are helpful insurance, but whole foods are still necessary. Nuts, seeds (sunflower, pumpkin), and their butters are good sources of zinc and some iron, as are beef, lamb, pork, and eggs. Just low iron status alone will invite more frequent and more severe infections for a child. Vitamin C will help iron absorption, so enjoying C-rich fruits and vegetables is an obvious go-to here. Oral supplements of C are reasonable too, to oral tolerance when sick, and to at least 100-200mg daily when well. Take probiotics: Several clinical trials have demonstrated that probiotics elicit a protective effect against upper respiratory tract infections. Despite all the best efforts, your kids may still get sick. Normal. Not normal: Back-to-back illnesses and infections, or needing one antibiotic after another. This signals a nutrition deficit that the immune system cannot overcome. Support your child’s body during illness with fluids, homemade bone or vegetable broths, healthy whole foods, little to no sugary foods, and rest rest rest. If an illness kicks in, there are many natural anti-viral substances that have shown promise, from olive leaf to goldenseal. Stay tuned for my next blog on using these for children down with flu. Judy, Glad to see you’re back! Edda West here from Canada. We’ve corresponded previously when you kindly gave me permission to reprint a few of your articles in our newsletter. I was surprised and delighted to receive an email from you yesterday announcing your Nutrition Care for Children newsletter. I’d love to reprint your article posted at:https://nutritioncare.net/steering-kids-clear-flu-food-nutrition/#.VFktWzTF9E6 in our fall newsletter. It’s a terrific article – thank you !! I’m just finalizing article selections right now and would be most grateful for permission to reprint it. I know our readers would really appreciate having this solid insight and advice on nutritional prevention of the flu. Of course Edda! Thank you for asking, I’d be thrilled to have you share my piece with your readers. All the best to you!